"Pallava" redirects here. For other uses, see Pallava (disambiguation). Pallava territories during Narasimhavarman I c. 645. This includes the Chalukya territories occupied by the Pallavas. The Pallava dynasty was a South Indian dynasty that existed between 275 CE to 897 CE, ruling a portion of what is today southern India. They gained prominence after the eclipse of the Satavahana dynasty, whom the Pallavas served as feudatories. Pallavas became a major power during the reign of Mahendravarman I (571 – 630 CE) and Narasimhavarman I (630 – 668 CE) and dominated the Telugu and northern parts of the Tamil region for about six hundred years until the end of the 9th century. Throughout their reign they were in constant conflict with both Chalukyas of Badami in the north and the Tamil kingdoms of Chola and Pandyas in the south and were finally defeated by the Chola kings in the 9th century CE. Pallavas are most noted for their patronage of architecture, the finest example being the Shore Temple (UNESCO World Heritage Site), still seen today in Mahabalipuram. The Pallavas, who left behind magnificent sculptures and temples, established the foundations of medieval South Indian architecture. They developed the Pallava script, whereas Grantha ultimately descended from it. Grantha was used to write Tamil for a short period before Tamil script became the de facto script and it's still used to write Sanskrit resp. Manipravalam. The Pallava script gave rise to several other southeast Asian scripts. Chinese traveller Hiuen Tsang visited Kanchipuram during Pallava rule and extolled their benign rule. Inner court or the circumambulatory passage with 58 subshrines. Kailasanathar Temple, Kanchipuram, Tamil Nadu, India. Typical design of pillar with multi-directional mythical lions. Kailasanathar Temple, Kanchipuram, Tamil Nadu, India. Temple view of Kailasanathar Temple, Kanchipuram, Tamil Nadu, India. A Sangam Period classic, Manimekalai, attributes the origin of the first Pallava King from a liaison between the daughter of a Naga king of Manipallava named Pilli Valai (Pilivalai) with a Chola king, Killivalavan, out of which union was born a prince, who was lost in ship wreck and found with a twig (pallava) of Cephalandra Indica (Tondai) around his ankle and hence named Tondai-man. Another version states "Pallava" was born from the union of the Brahmin Ashvatthama with a Naga Princess also supposedly supported in the sixth verse of the Bahur plates which states "From Ashvatthama was born the king named Pallava". The Pallavas themselves claimed to descend from Brahma and Ashvatthama. ...from him (Aśvatthāman) in order (came) Pallava, the lord of the whole earth, whose fame was bewildering. Thence, came into existence the race of Pallavas... [including the son of Chūtapallava] Vīrakūrcha, of celebrated name, who simultaneously with (the hand of) the daughter of the chief of serpents grasped also the complete insignia of royalty and became famous. From [them] descended the powerful, spotless Pallava dynasty [vaṁśāvatāra], which resembled a partial incarnation [aṃśāvatāra] of Visnu, as it displayed unbroken courage in conquering the circle of the world...and which resembled the descent of the Ganges [gaṅgāvatāra] as it purified the whole world. The Proceedings of the First Annual Conference of South Indian History Congress also notes: The word Tondai means a creeper and the term Pallava conveys a similar meaning. Since the Pallavas ruled in the territory extending from Bellary to Bezwada, it led to the theory that they were a northern dynasty who contracted marriages with princesses of the Andhra Dynasty and so inherited a portion of southern Andhra Pradesh. Historian K. R. Subramanian says the Pallavas were originally a Telugu power rather than a Tamil one. Telugu sources know of a Trilochana Pallava as the earliest Telugu king and they are confirmed by later inscriptions. The first Chalukya king is said to have been met, repulsed and killed by the same Trilochana near Mudivemu (Cuddappah district). A Buddhist story describes Kala the Nagaraja, resembling the Pallava Kalabhartar as a king of the region near Krishna district. The Pallava Bogga may be identified with the kingdom of Kala in Andhra which had close and early maritime and cultural relations with Ceylon. K. A. Nilakanta Sastri postulated that Pallavas were descendants of a North Indian dynasty who moved southwards, adopted local traditions to their own use, and named themselves as Tondaiyar after the land called Tondai. K. P. Jayaswal also proposed a North Indian origin, putting forward the theory that the Pallavas were a branch of the Vakatakas. The earliest inscriptions of the Pallavas were found in the districts of Bellary, Guntur and Nellore and all the inscriptions of the dynasty till the rise of Simhavishnu were found in the latter two of those. The Pallavas captured Kanchi from the Cholas as recorded in the Velurpalaiyam Plates, around the reign of the fifth king of the Pallava line Kumaravishnu I. Thereafter Kanchi figures in inscriptions as the capital of the Pallavas. The Cholas drove the Pallavas away from Kanchi in the mid-4th century, in the reign of Vishugopa, the tenth king of the Pallava line. The Pallavas re-captured Kanchi in the mid-6th century, possibly in the reign of Simhavishnu, the fourteenth king of the Pallava line, whom the Kasakudi plates state as "the lion of the earth". Thereafter the Pallavas held on to Kanchi until the 9th century, until the reign of their last king, Vijaya-Nripatungavarman. The Pallavas were in conflict with major kingdoms at various periods of time. A contest for political supremacy existed between the early Pallavas and the Kadambas. Numerous Kadamba inscriptions provide details of Pallava-Kadamba hostlities. During the reign of Vishnugopavarman II (approx. 500-525), political convulsion engulfed the Pallavas due to the Kalabhra invasion of the Tamil country. Towards the close of the 6th century, the Pallava Simhavishnu stuck a blow against the Kalabhras. The Pandyas followed suit. Thereafter the Tamil country was divided between the Pallavas in the north with Kanchipuram as their capital, and Pandyas in the south with Madurai as their capital. The royal custom of using a series of descriptive honorific titles, Birudas, was particularly prevalent among the Pallavas. The birudas of Mahendravarman I are in Sanskrit, Tamil and Telugu. The Telugu birudas show Mahendravarman's involvement with the Andhra region continued to be strong at the time he was creating his cave-temples in the Tamil region. The suffix "Malla" was used by the Pallava rulers. Mahendravarman I used the biruda, Satrumalla, "a warrior who overthrows his enemies", and his grandson Paramesvara I was called Ekamalla "the sole warrior or wrestler". Pallava kings, presumably exalted ones, were known by the title Mahamalla ("great wrestler"). All the early Pallava royal inscriptions are either in Sanskrit or in Prakrit language, considered the official languages of the dynasty while the official scripts were Pallava script and later Grantha. Similarly, inscriptions found in Andhra Pradesh and Karnataka State are in Sanskrit and Prakrit. The phenomenon of using Prakrit as official languages in which rulers left their inscriptions and epigraphies continued till the 6th century. It would have been in the interest of the ruling elite to protect their privileges by perpetuating their hegemony of Prakrit in order to exclude the common people from sharing power (Mahadevan 1995a: 173–188). The Pallavas in their Tamil country used Tamil and Sanskrit in their inscriptions. Tamil came to be the main language used by the Pallavas in their inscriptions, though a few records continued to be in Sanskrit. This language was first adopted by Mahendravarman I himself in a few records of his; but from the time of Paramesvaravarman I, the practice came into vogue of inscribing a part of the record in Sanskrit and the rest in Tamil. Almost all the copper plate records, viz., Kasakudi, Tandantottam, Pattattalmangalm, Udayendiram and Velurpalaiyam are composed both in Sanskrit and Tamil. Under the Pallava dynasty, a unique form of Grantha script, a descendent of Pallava script which is a type of Brahmic script, was used. Around the 6th century, it was exported eastwards and influenced the genesis of almost all Southeast Asian scripts. Pallavas were followers of Hinduism and made gifts of land to gods and Brahmins. In line with the prevalent customs, some of the rulers performed the Aswamedha and other Vedic sacrifices. They were, however, tolerant of other faiths. The Chinese monk Xuanzang who visited Kanchipuram during the reign of Narasimhavarman I reported that there were 100 Buddhist monasteries, and 80 temples in Kanchipuram. The Pallavas were instrumental in the transition from rock-cut architecture to stone temples. 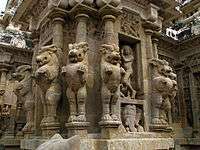 The earliest examples of Pallava constructions are rock-cut temples dating from 610–690 and structural temples between 690–900. A number of rock-cut cave temples bear the inscription of the Pallava king, Mahendravarman I and his successors. 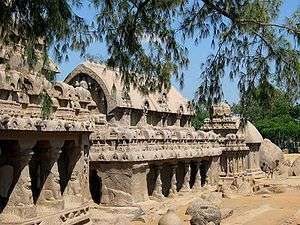 Among the accomplishments of the Pallava architecture are the rock-cut temples at Mahabalipuram. There are excavated pillared halls and monolithic shrines known as Rathas in Mahabalipuram. Early temples were mostly dedicated to Shiva. The Kailasanatha temple in Kanchipuram and the Shore Temple built by Narasimhavarman II, rock cut temple in Mahendravadi by Mahendravarman are fine examples of the Pallava style temples. The temple of Nalanda Gedige in Kandy, Sri Lanka is another. The famous Tondeswaram temple of Tenavarai and the ancient Koneswaram temple of Trincomalee were patronized and structurally developed by the Pallavas in the 7th century. The Pallava period beginning with Simhavishnu (575 AD – 900 AD) was a transitional stage in southern Indian society with monument building, foundation of devotional (bhakti) sects of Alvars and Nayanars, the flowering of rural brahmanical institutions of Sanskrit learning, and the establishment of chakravartin model of kingship over a territory of diverse people; which ended the pre-Pallavan era of territorially segmented people, each with their culture, under a tribal chieftain. While a system of ranked relationship among groups existed in the classical period, the Pallava period extolled ranked relationships based on ritual purity as enjoined by the shastras. Burton distinguishes between the chakravatin model and the kshatriya model, and likens kshatriyas to locally based warriors with ritual status sufficiently high enough to share with brahmins; and states that in south India the kshatriya model did not emerge. As per Burton, south India was aware of the Indo-Aryan varna organized society in which decisive secular authority was vested in the kshatriyas; but apart from the Pallava, Chola and Vijayanagar line of warriors which claimed chakravartin status, only few locality warrior families achieved the prestigious kin-linked organization of northern warrior groups. The earliest documentation on the Pallavas is the three copper-plate grants, now referred to as the Mayidavolu, Hirahadagalli and the British Museum plates (Durga Prasad, 1988) belonging to Skandavarman I and written in Prakrit. Skandavarman appears to have been the first great ruler of the early Pallavas, though there are references to other early Pallavas who were probably predecessors of Skandavarman. Skandavarman extended his dominions from the Krishna in the north to the Pennar in the south and to the Bellary district in the West. He performed the Aswamedha and other Vedic sacrifices and bore the title of 'Supreme King of Kings devoted to dharma'. In the reign of Simhavarman IV, who ascended the throne in 436, the territories lost to the Vishnukundins in the north up to the mouth of the Krishna were recovered. 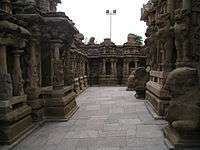 The early Pallava history from this period onwards is furnished by a dozen or so copper-plate grants in Sanskrit. They are all dated in the regnal years of the kings. The incursion of the Kalabhras and the confusion in the Tamil country was broken by the Pandya Kadungon and the Pallava Simhavishnu. Mahendravarman I extended the Pallava Kingdom and was one of the greatest sovereigns. Some of the most ornate monuments and temples in southern India, carved out of solid rock, were introduced under his rule. He also wrote the play Mattavilasa Prahasana. 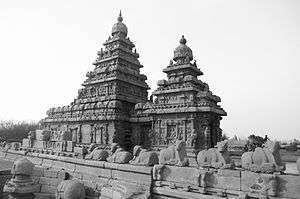 The Pallava kingdom began to gain both in territory and influence and were a regional power by the end of the 6th century, defeating kings of Ceylon and mainland Tamilakkam. Narasimhavarman I and Paramesvaravarman I stand out for their achievements in both military and architectural spheres. Narasimhavarman II built the Shore Temple. We have a certain number of charters in Prakrit of which three are important ones. Then follows a dynasty which issued their charters in Sanskrit; following this came the family of the great Pallavas beginning with Simha Vishnu; this was followed by a dynasty of the usurper Nandi Varman, another great Pallava. We are overlooking for the present the dynasty of the Ganga-Pallavas postulated by the Epigraphists. The earliest of these Pallava charters is the one known as the Mayidavolu 1 (Guntur district) copper-plates. Pallava royal lineages were influential in the old kingdom of Kedah of the Malay Peninsula under Rudravarman I, Champa under Bhadravarman I and the Kingdom of the Funan in Cambodia. 1 2 Ordhendra Coomar Gangoly. The art of the Pallavas, Volume 2 of Indian Sculpture Series. G. Wittenborn, 1957. p. 2. ↑ Jaiswal, Suvira (2000). Caste: origin, function, and dimensions of change. Manohar Publishers. p. 115. ISBN 9788173043345. 1 2 3 4 Rabe, Michael D (1997). "The Māmallapuram Praśasti: A Panegyric in Figures". Artibus Asiae. 57 (3/4): 189–241. JSTOR 3249929. (subscription required (help)). ↑ KR Subramanian. (1989). Buddhist remains in Āndhra and the history of Āndhra between 224 & 610 A.D, p.71: The Pallavas were first a Telugu and not a Tamil power. Telugu traditions know a certain Trilochana Pallava as the earliest Telugu King and they are confirmed by later inscriptions. ↑ A.Krishnaswami. Topics in South Indian history: from early times upto 1565 A.D. Krishnaswami, 1975. pp. 89–90. ↑ Tyagi, Anil Kumar (2016). "Political History of Southern India (500-750AD)". In Roma Chatterjee. Ancient India. New Delhi: Publications Division, Ministry of Information and Broadcasting, Government of India. pp. 118–124. ISBN 978-81-230-1896-6. ↑ Sen, Sailendra Nath (1999). Ancient Indian History And Civilization. New Age International. p. 445. ISBN 9788122411980. ↑ Burton Stein (1980). Peasant state and society in medieval South India. Oxford University Press. p. 63-64. 1 2 3 Burton Stein (1980). Peasant state and society in medieval South India. Oxford University Press. p. 70. 1 2 3 4 5 6 7 8 9 10 Sen, Sailendra (2013). A Textbook of Medieval Indian History. Primus Books. pp. 41–42. ISBN 978-9-38060-734-4. ↑ Cœdès, George (1968-01-01). The Indianized States of South-East Asia. University of Hawaii Press. ISBN 9780824803681. Raghava Iyengar, R (1949). Perumbanarruppatai, a commentary. Chidambaram, India: Annamalai University Press.